Grossing $350,000 from 1.2 acres of growing space seems incredible to many operators. 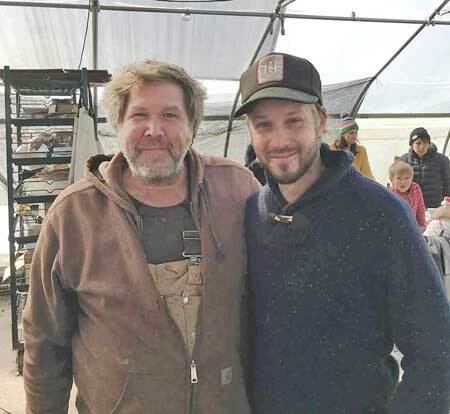 For Conor Crickmore, owner of Neversink Farm in Claryville, NY, it’s all a matter of achieving optimal efficiency without using tillage or tractors. Since farmers control little of what happens between planting and harvest, Crickmore emphasizes planning what he can to maximize production. Previously, Crickmore had only grown a home garden. He had been working in the computer industry in the city and wanted out. He and his wife, Kate, moved to the country and planned to homestead. “At some point, we knew we had to start earning a living and that’s how the farm really started,” Crickmore said. They began farming in 2011. Crickmore starts with soil health. He balances the soil chemistry and physics. Chemistry relates to the results of his soil test to make sure that the nutrients are in balance. He hires a soil consultant and Crickmore also performs soil tests on 3,000 to 5,000 square feet every year, resulting in about 20 tests annually. He also balances the physics of the soil, such as too much clay, too much sand, not enough organic matter or too many rocks. He tends to have sandy soil, so adding peat, clay and compost before planting helps. He’s also careful to not compact the soil by walking or driving on it. He aerates the soil manually, using a broad fork. He fertilizes with compost, alfalfa meal, soybean meal, kelp, fish meal and other organic material and no plastic is used on the farm. He believes that a constant, slow feeding of organic material feeds life into the soil. Intensive planning ensures that he has a crop in all his fields at all times. Since he manages his soil health so closely, Crickmore never has to leave a field fallow. When he first began the farm, he experienced significant pest problems. However, by promptly addressing pest issues, such as moving a crop into the greenhouse, he permanently solves the problem. As a grower certified by NOFA New York, he can’t use pesticides or herbicides. He uses no weed suppression system except hand cultivation and flame weeding. Fastidious weeding means that the weeds don’t have the chance to go to seed and spread. Before replanting a bed, he burns it off with the flame weeder. Crickmore staggers plantings so that if a disease occurs, it won’t wipe out the entire harvest. He grows his tomatoes in the greenhouse, so blight rarely affects them. He vents the greenhouse to keep humidity down and thus inhibit fungus growth. About 25 to 30 percent of what he grows is in greenhouses. Crickmore said if he could, he’d put everything in greenhouses since it would nearly eliminate management effort. Every year, he erects a new hoop house, which also extends his growing season. By using enclosed space heated with forced hot air, he gets a few weeks’ jump on harvesting crops such as potatoes. Crickmore counts that as a huge advantage for marketing to wholesale buyers. He also sells produce at farmers markets, sells online courses on increasing farm profitability and recently launched a product line targeting small scale farmers. He promotes the various divisions of the business on Facebook and YouTube. Crickmore employs two to five during the summer and two during the winter.